Notes Most of the stage takes place on water. 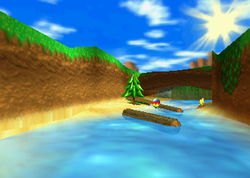 Boulder Canyon is an area in the Dragon Forest area of Timber Island in the games Diddy Kong Racing and its remake, Diddy Kong Racing DS. Twenty Golden Balloons are needed to unlock it, but thirty balloons are required to unlock its Silver Coin challenge. During the race on this track, racers must use their hovercraft to ride over the running water. There are some moving logs floating atop the water to knock players around and hitting into them could bring a player into last place, so they should be avoided at all costs. There is also a bridge farther into the stage and it can rise if a racer is to hit the bell at the end of it. The track is also notorious for its fork in the road, which is made up of two passages in a dark sewer. However, the two roads are not any different from each other and they both lead to the same place. In the Nintendo DS remake, this fork in the road does not have colored walls for differentiation. Boulder Canyon contains the key to unlock Dragon Forest's challenge level, Smokey Castle. It can be reached if the player raises the bridge and rides over it. With some help from a blue Item Balloon, which is needed to get a speed boost, the player should be able to use the bridge as a ramp to grab the key in a hidden alcove. The track begins with a small turn along the river. There are some logs in the center of the track to get in the players' way. After riding over a small log, racers must ride down a small hill. There are a few Item Balloons along the side of this area, most of which can give the racer an extra speed boost. The river empties into a small lake, which has a lone log in the center of it. To the right of this log is a rather short tunnel leading onto a bridge. Crossing the bridge takes players into the castle, but if they fall off the bridge, they have to ride around the entrance and enter the castle by its sides. Inside the castle, the first Zipper can be found, boosting players up a small hill. A sharp turn at the top of the area takes the racers to another Zipper seen near the wall. There is another set of Item Balloons after this, as well as the way into the castle's sewers. Two sharp turns make up the beginning of this dark area. There are two groups of Item Balloons in the center area of this sewer, and both sets are parallel to each other. A fork in the road can also be seen here. Both roads take the racers to the same point at the same speed, but they both have different items. While the left passage gives the players a red Item Balloon to attack opponents in front of them, the passage on the right gives them a green balloon to attack players from behind. The two roads intersect each other and lead Diddy Kong and other racers outside of the sewers. Outside of the damp cave, players must continue through the river and dodge a few logs. There are two Zippers along the outside of this path. One can be found just after exiting the sewers, while the second Zipper is located just before a waterfall. Players need to ride down this waterfall to continue. There is one final sharp turn before the end of the track, as well as one more log. After the turn, the finish line is just ahead. Like the other levels of Diddy Kong Racing and Diddy Kong Racing DS, Boulder Canyon is filled with eight coins, scattered all around the area. However, the coins only appear once the player has beaten the world's boss at least once. The first coin is located to the right of the first two Item Balloons. The next coin can be found at the top of the small waterfall leading to the castle. At the bottom of the waterfall, the third coin can be found next to a log. After crossing the bridge, the racer must head over the nearby Zipper to run into the next coin. The fifth Silver Coin is at the left corner of the sewer's entrance near a Zipper. At the fork in the road, one can take the left passage to come to the next coin. The seventh coin is found right after the sixth coin in the left passage of the fork in the road. After players make their way out of the castle sewers, they can find the final coin behind the next Zipper. This page was last edited on December 19, 2018, at 21:57.